A key activity in web automation is the extraction of data from websites, also known as web scraping or screen scraping. Whether it is price lists, stock information, financial data or any other type of data, iMacros can extract this data for you and either re-use the data or store it in a file or database. iMacros can write extracted data to standard text files, including the comma separated value (.csv) format, readable by spreadsheet processing packages. Also, iMacros can make use of the powerful scripting interface to save data directly to databases. This means that the syntax of the command is now the same as for the TAG command, with the type of extraction specified by the additional EXTRACT parameter. The Extraction Wizard can be used to automatically generate and test extractions. Whilst in record mode, open the Text Extraction Wizard ("Text" button on the Rec tab). In the browser window or frame select the text that you want to extract. Choose what type of extraction you want to perform on that element, like TXT, HTM, HREF, ALT, TXTALL, or TITLE. Not all types are available for all elements. The extracted information will be displayed in the wizard. iMacros also creates a suggestion for the tag command attribute and position. If the result is #EANF# (Extraction Anchor Not Found) you will need to alter the extraction anchor in order to successfully extract the data. If you are satisfied with the result click "Add Command" to add a TAG command with the EXTRACT statement to the macro. Table extract commands can be easily produced and checked using the Text Extract Wizard. 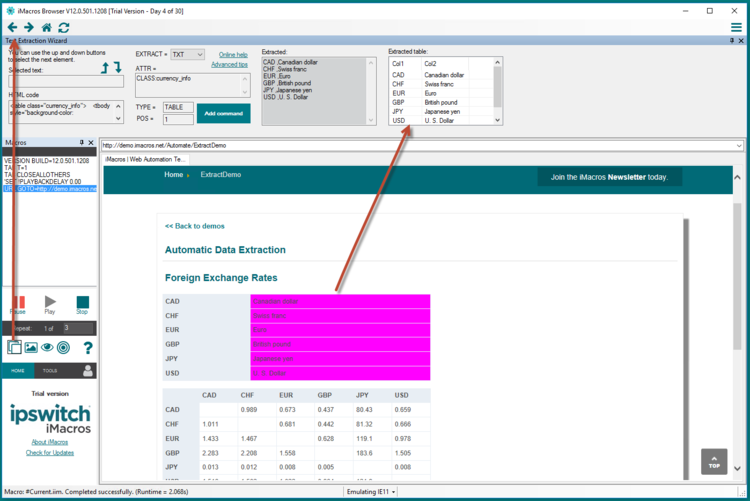 If the element chosen is a table, the table data is properly formatted and displayed in the wizard. 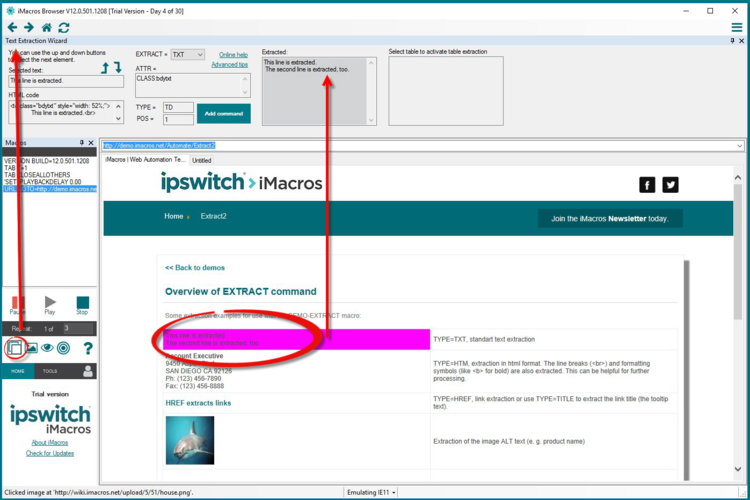 Note: The extraction wizard is only available in the iMacros Browser and iMacros for Internet Explorer But the generated commands can be used in all iMacros versions. If the information you want to extract is inside a framed website you need to have a FRAME command to mark the frame as active for extraction. When recording a TAG command the FRAME command will automatically be generated. Within the Extraction Wizard, when selecting the data to be extracted the FRAME command will automatically be generated. In order to manually create an extraction tag, it is necessary to first record a TAG command. In record mode, click on the data to be extracted. After stopping the macro recording, open the macro for editing and replace the CONTENT= attribute with the EXTRACT=TXT parameter (or just simply add the EXTRACT parameter to the end of the command if the CONTENT parameter does not exist). If you need to extract other information than text you can use the TXTALL, HTM, HREF, TITLE, ALT or CHECKED attribute instead of TXT. Starting with iMacros 10.2, you can extract any attribute. If you want to know which attributes are available, record the TAG command in Expert Mode. ComputerName=* is the initial immutable part of the tooltip content and is used to specify which tooltip should be extracted. Recording in Expert Mode will create a TAG command that consists of all attributes of the clicked HTML element. Alternatively, you can use the SAVEAS command to save the complete web page. Use TAG TYPE=TABLE ... to extract the content of a complete table with one command. Example: Demo-Extract-Table. This method works well with simple, well-formatted tables. For more tricky table extractions you always have the option to extract them cell by cell as shown in the !ENDOFPAGE example. Table cells in the extracted data are separated by the string #NEXT# and table rows are delimited by the string #NEWLINE#. These tags are automatically translated into commas and newlines when you use the "SAVEAS TYPE=EXTRACT" command, but the delimiters are retained when returning the data to a script via a call to iimGetExtract. If the table you are attempting to extract also contains nested tables, then the inner table data will also be separated by commas and new lines (in CSV format, via SAVEAS), or #NEXT# and #NEWLINE# (via iimGetExtract). You can use the Text Extraction Wizard to see the resulting extracted table, but in this case, for visual simplicity, the inner tables are shown as plain text, without the delimiters. To extract the URL of a website as shown in the browser address bar please use the built-in !URLCURRENT variable and store this value in !EXTRACT with the SET or ADD command. If in one macro several EXTRACT commands appear then the results are separated by the string [EXTRACT]. As you can see the [EXTRACT] tags, which are inserted to distinguish results from different EXTRACT commands, are substituted by commas. If in the Options dialog you have checked "Use regional settings in CSV files", the "comma" between each extraction is going to be your system list separator (a semi-colon ";" for instance) instead of ",". The SAVEAS command erases the content of the !EXTRACT variable afterward. With the next start of the macro or the next round of a loop a new line is added to the file. Each time you add something to !EXTRACT either by using the ADD command or as part of a TAG...EXTRACT command, it will save that value as a separate column when using SAVEAS TYPE=EXTRACT. All extracted data can be sent to your code via the Scripting Interface. This gives you all the power of any programming language you choose to process the extracted information further or simply save it to a file. Use the iimGetLastExtract command to return the extracted information from the macro. The extracted text is returned as a string. Extracted information resulting from different extractions are separated by [EXTRACT], e.g. Remember: Using the "SAVEAS TYPE=EXTRACT" command will reset the contents of the !EXTRACT variable. Thus, using this command in a macro whose extraction result you wish to obtain via the Scripting Interface will result in an empty string in your application! Use iimGetLastExtract to retrieve the values. s = "One US$ costs " + iim1.iimGetLastExtract(1) + " EURO or " + iim1.iimGetLastExtract(2) + " British Pounds (GBP)"
If the extraction was unsuccessful, i.e. the extraction anchor could not be found on the page, the !EXTRACT variable holds the string #EANF# (Extraction Anchor Not Found). However, the return value that informs you whether the execution of a macro was successful is still positive (iimPlay = 1). The reason for this behavior is that a macro can have many TAG...EXTRACT commands and often only one or a few of them do not find the extraction anchor. If you want to check if a particular EXTRACT command was successful you just need to check if #EANF# is present in the returned string. Often this can be very useful, for example, if you use EXTRACT to check if a keyword is present on a page. A returned string containing #EANF# indicates that the keyword is not found. For comparison, if a standard TAG command cannot locate the defined element then iMacros returns an error. The Image Extraction Wizard helps you the create the right commands TAG... CONTENT=EVENT:SAVEITEM for image web scraping. Please see the Save Web Page Elements chapter for more details. in the macro at any position before dialog appears. Now the content of a dialog is added to the extracted text, i.e. to the !EXTRACT variable. The PROMPT command in this example is simply used to show the extracted values. The WAIT statement is not directly required, but there has to be a 1-2 seconds delay between the time you trigger the dialog and the first time you use the extracted dialog text. The reason for this is that there is a small delay between the time the TAG command triggers the dialog (e. g. by clicking on a link) and the time the dialog actually appears. iMacros has no way of knowing beforehand that a certain link will trigger a dialog. So it has to "catch" the dialog once it appears and then handle it. Typically this whole process is fast and takes less than a second, but until it is complete the !EXTRACT variable is not filled with the text from the dialog. In HTML code drop-down lists are generated by a SELECT tag. Some web pages make use of a <PRE ...> tag in their HTML code. It marks the enclosed text as preformatted -- all the spaces and carriage returns are rendered exactly as you type them. The information enclosed in a <PRE> tag is extracted correctly (including the formatting!) by iMacros. Thus, if you transfer the extracted data via the Scripting Interface all formatting information is retained unchanged. The formatting is only changed on two occasions: line breaks are removed when displaying the result in the test dialog box and when saving the result using the SAVEAS command. This is necessary to ensure proper formatting of the CSV formatted text file because in the CSV format a line break would start a new line. Note: For changes in the upcoming iMacros V7 please see V7_Relative_positioning. In a nutshell, the principle stays the same, but the position is now relative to the end (close tag) of the anchor element, so iMacros V7 and iMacros for Firefox extract macros are now compatible. Extract the current gold price (sell/buy) given the item number. We use relative extraction to get the prices in the line with the correct item number. When extracting data from a complex website the extraction can be made easier if you can tell iMacros to start the search for the extraction anchor after a specific point on the page (as opposed to starting from the top, which is the default). E.g., assume you want to extract data from a specific cell in a table, in this case, the size of the land in the second table. will potentially result in the extraction of an unwanted result. With relative positioning you tell iMacros to search for the extraction anchor located after the position that is indicated by a TAG command immediately before your TAG...EXTRACT command. In our case we click on the table title "Land" before starting the extraction wizard to create a TAG command. Note that this TAG command does not click on any link, rather it only marks an element to indicate a position for the following TAG command. Relative positions are indicated with an R before the position number. If you want to use a button or a link as reference, you should tag it with TAG ... EXTRACT=TXT, to avoid following the link or "pushing" the button. In that case, do not forget to use SET !EXTRACT NULL, to clear the extract variable before the real extract. Use !ENDOFPAGE to limit the extraction to a range above a certain trigger word or image. Extracting data from Amazon.com with Relative Positioning. In this example, we use the word "Price" to find the book price. This creates very stable web-scraping macros. Backwards relative positions: Since iMacros V6.20 you can also indicate backward positions (= to the left and/or top of a selected element). This negative relative extractions supports up to 10 backwards steps (POS=R-10). Negative (backward) Positioning. The task is to select the checkbox to the left of a given order-ID. Since the select box itself has no name, we use the ID in the second column to find the checkbox. If you use relative extraction and a certain data record (e. g. a phone number) is missing on a page, then the macro would normally stop with a TAG error as the TAG for the anchor fails. But that is not what you want during an extraction: You simply want the macro to continue and extract all other values that exist. => Solution: Add SET !ERRORIGNORE YES. Note that when the anchor TAG immediately before a relative extraction fails, then the extraction itself also fails (= returns #eanf#). This is by design to make sure that iMacros extracts only the intended value (if the extraction anchor exists) or no value ("#eanf#") if the extraction anchor is not found. OTHERNAME was added to the TXT:MyTable attribute to trigger the extraction anchor failure for demo purposes. Nested elements: When does the search start? How to extract a certain word in a paragraph? How to click on the last element on a page? iMacros runs on all language version of Windows, including the so-called "double-byte" languages like Chinese, Japanese or Korean. iMacros and the Scripting Interface include full Unicode support, so you can extract Asian language characters (e.g. Japanese) even on Western Windows versions (e.g. English). This page was last modified on 9 October 2018, at 11:33. This page has been accessed 1,182,301 times.